Geography in its most literal sense is a description of the features on the surface of Earth or another planet. Three coordinates—latitude, longitude, and altitude—suffice for locating all such features. Similarly, the location of any object in the solar system can be specified by three parameters—heliocentric ecliptic longitude, heliocentric ecliptic latitude, and heliocentric distance. Such positions, however, are valid for only an instant of time since all objects in the solar system are continuously in motion. Thus, a better descriptor of the "location" of a solar system object is the path, called the orbit, that it follows around the Sun or, in the case of a planetary satellite (moon), the path around its parent planet. All asteroids orbit the Sun in elliptical orbits and move in the same direction as the major planets. Some elliptical orbits are very nearly circles, while others are highly elongated (eccentric). An orbit is completely described by six geometric parameters called its elements. Orbital elements, and hence the shape and orientation of the orbit, also vary with time because each object is gravitationally acting on, and being acted upon by, all other bodies in the solar system. In most cases, these gravitational effects can be accounted for so that accurate predictions of past and future locations can be made and a mean orbit can be defined. These mean orbits can then be used to describe the geography of the asteroid belt. Because of their widespread occurrence, asteroids are assigned numbers as well as names. The numbers are assigned consecutively after accurate orbital elements have been determined. Ceres is officially known as (1) Ceres, Pallas as (2) Pallas, and so forth. Of the more than 450,000 asteroids discovered by 2009, about 47 percent were numbered. Asteroid discoverers have the right to choose names for their discoveries as soon as they are numbered. The names selected are submitted to the International Astronomical Union (IAU) for approval. Prior to the mid-20th century, asteroids were sometimes assigned numbers before accurate orbital elements had been determined, and so some numbered asteroids could not later be located. These objects were referred to as "lost" asteroids. The final lost numbered asteroid, (719) Albert, was recovered in 2000 after a lapse of 89 years. Many newly discovered asteroids still become "lost" because of an insufficiently long span of observations, but no new asteroids are assigned numbers until their orbits are reliably known. The Minor Planet Center at the Harvard-Smithsonian Center for Astrophysics in Cambridge, Mass., maintains computer files for all measurements of asteroid positions. As of 2009, there were more than 60 million such positions in its database. Asteroid distribution between Mars and Jupiter. (Top) Numbers of asteroids from a total of more than 69,500 with known orbits are plotted against their mean distances from the Sun. Major depletions, or gaps, of asteroids occur near the mean-motion resonances with Jupiter between 4:1 and 2:1, whereas asteroid concentrations are found near other resonances. The distribution does not indicate true relative numbers, because nearer and brighter asteroids are favoured for discovery. In reality, for any given size range, three to four times as many asteroids lie between the 3:1 and 2:1 resonances as between the 4:1 and 3:1 resonances. (Bottom) Relative percentages of six major asteroid classes are plotted against their mean distances. At a given mean distance, the percentages of the classes present total 100 percent. As the graph reveals, the distribution of the asteroid classes is highly structured, with the different classes forming overlapping rings around the Sun. Encyclopedia Britannica, Inc.
in a three-to-one (written 3:1) resonance orbit with Jupiter. Consequently, once every three orbits, Jupiter and an asteroid in such an orbit would be in the same relative positions, and the asteroid would experience a gravitational force in a fixed direction. Repeated applications of this force would eventually change the mean distance of this asteroid—and others in similar orbits—thus creating a gap at 2.50 AU. Major gaps occur at distances from the Sun that correspond to resonances with Jupiter of 4:1, 3:1, 5:2, 7:3, and 2:1, with the respective mean distances being 2.06, 2.50, 2.82, 2.96, and 3.28. The major gap at the 4:1 resonance defines the nearest extent of the main belt; the gap at the 2:1 resonance, the farthest extent. Some mean-motion resonances, rather than dispersing asteroids, are observed to collect them. Outside the limits of the main belt, asteroids cluster near resonances of 5:1 (at 1.78 AU, called the Hungaria group), 7:4 (at 3.58 AU, the Cybele group), 3:2 (at 3.97 AU, the Hilda group), 4:3 (at 4.29 AU, the lone asteroid (279) Thule), and 1:1 (at 5.20 AU, the Trojan groups). The presence of other resonances, called secular resonances, complicates the situation, particularly at the sunward edge of the belt. Secular resonances, in which two orbits interact through the motions of their ascending nodes, perihelia, or both, operate over timescales of millions of years to change the eccentricity and inclination of asteroids. Combinations of mean-motion and secular resonances can either result in long-term stabilization of asteroid orbits at certain mean-motion resonances, as is evidenced by the Hungaria, Cybele, Hilda, and Trojan asteroid groups, or cause the orbits to evolve away from the resonances, as is evidenced by the Kirkwood gaps. Asteroids that can come close to Earth are called near-Earth asteroids (NEAs), although only some NEAs actually cross Earth's orbit. NEAs are divided into several classes. Asteroids belonging to the class most distant from Earth—those asteroids that can cross the orbit of Mars but that have perihelion distances greater than 1.3 AU—are dubbed Mars crossers. This class is further subdivided into two: shallow Mars crossers (perihelion distances no less than 1.58 AU but less than 1.67 AU) and deep Mars crossers (perihelion distances greater than 1.3 AU but less than 1.58 AU). The next most distant class of NEAs is the Amors. Members of this group have perihelion distances that are greater than 1.017 AU, which is Earth's aphelion distance, but no greater than 1.3 AU. Amor asteroids therefore do not at present cross Earth's orbit. Because of strong gravitational perturbations produced by their close approaches to Earth, however, the orbital elements of all Earth-approaching asteroids except the shallow Mars cross-ers change appreciably on timescales as short as years or decades. For this reason, about half the known Amors, including (1221) Amor, the namesake of the group, are part-time Earth crossers. Only asteroids that cross the orbits of planets—i.e., Earth-approaching asteroids and idiosyncratic objects such as (944) Hidalgo and Chiron—suffer significant changes in their orbital elements on timescales shorter than many millions of years. There are two classes of NEAs that deeply cross Earth's orbit on an almost continuous basis. The first of these to be discovered were the Apollo asteroids, named for (1862) Apollo, which was discovered in 1932 but was lost shortly thereafter and not rediscovered until 1978. The mean distances of Apollo asteroids from the Sun are greater than or equal to 1 AU, and their perihelion distances are less than or equal to Earth's aphelion distance of 1.017 AU; thus, they cross Earth's orbit when near the closest points to the Sun in their own orbits. The other class of Earth-crossing asteroids is named Atens for (2062) Aten, which was discovered in 1976. The Aten asteroids have mean distances from the Sun that are less than 1 AU and aphelion distances that are greater than or equal to 0.983 AU, the perihelion distance of Earth; they cross Earth's orbit when near the farthest points from the Sun of their orbits. The class of NEAs that was the last to be recognized is composed of asteroids with orbits entirely inside that of Earth. Known as Atira asteroids after (163693) Atira, they have mean distances from the Sun that are less than 1 AU and aphelion distances less than 0.983 AU; they do not cross Earth's orbit. As of 2009, the known Atira, Aten, Apollo, and Amor asteroids of all sizes numbered 9, 510, 3,081, and 2,577, respectively, although these numbers are steadily increasing as the asteroid survey programs progress. Most of these were discovered since 1970, when dedicated searches for these types of asteroids were begun. Astronomers have estimated that there are roughly 50 Atens, 600 Apollos, and 250 Amors that have diameters larger than about 1 km (0.6 miles). similar to Castalia, Toutatis appears predominantly to be two components in contact, one about twice as large as the other. The highest-resolution images show craters having diameters between 100 and 600 metres (roughly 300 and 2,000 feet). Radar images of (1620) Geographos obtained in 1994 were numerous enough and of sufficient quality for an animation to be made showing it rotating. The orbital characteristics of NEAs mean that some of these objects make close approaches to Earth and occasionally collide with it. In January 1991, for example, an Apollo asteroid (or, as an alternative description, a large meteor-oid) with an estimated diameter of 10 metres (33 feet) passed by Earth within less than half the distance to the Moon. Such passages are not especially unusual. On Oct. 6, 2008, the asteroid 2008 TC3, which had a size of about 5 metres (16 feet), was discovered and crashed in the Nubian desert of the Sudan the next day. The collision of a sufficiently large NEA with Earth is generally recognized to pose a great potential danger to human beings and possibly to all life on the planet. Because of the small sizes of NEAs and the short time they spend close enough to Earth to be seen, it is unusual for such close passages to be observed. 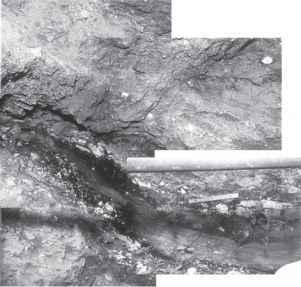 An example of a NEA for which the lead time for observation is large is (99942) Apophis. This Aten asteroid, which has a diameter of about 300 m (984 feet), is predicted to pass within 32,000 km (19,884 miles) of Earth—i.e., closer than communications satellites in geostationary orbits—on April 13, 2029. During that passage, the probability of the asteroid hitting Earth is thought to be near zero. In 2006, however, it had been estimated that Apophis would have about 1 chance in 50,000 of colliding with Earth during the following close approach, on April 13, 2036. Within the main belt are groups of asteroids that cluster with respect to certain mean orbital elements (semimajor axis, eccentricity, and inclination). Such groups are called families and are named for the lowest numbered asteroid in the family. Asteroid families are formed when an asteroid is disrupted in a catastrophic collision, the members of the family thus being pieces of the original asteroid. Theoretical studies indicate that catastrophic collisions between asteroids are common enough to account for the number of families observed. About 40 percent of the larger asteroids belong to such families, but as high a proportion as 90 percent of small asteroids (i.e., those about 1 km [0.6 miles] in diameter) may be family members because each catastrophic collision produces many more small fragments than large ones. Fist-sized meteorite fragment that fell in western Australia in 1960 and is thought to have been ejected from the surface of the asteroid Vesta in a collision. 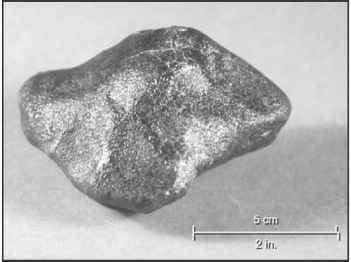 The meteorite has the same unique spectral signature of the mineral pyroxene, which is common in lavas, as that obtained from Vesta. Its shiny black fusion crust was produced by fric-tional heating as it fell through Earth's atmosphere. R. Kempton/New England Meteoritical Services collisions similar to those that produced the asteroid families. For example, the asteroid Vesta, whose surface appears to be basaltic rock, is widely believed to be the parent body of the meteorites known as basaltic achondrite HEDs, a grouping of the related how-ardite, eucrite, and diogenite meteorite types. 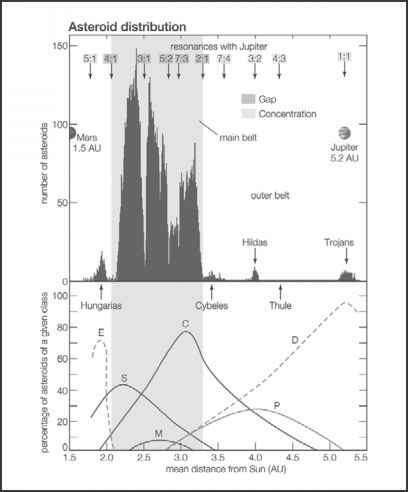 Only one known concentration of asteroids, the Hungaria group, occupies the region between Mars and the inner edge of the main belt. The orbits of all the Hungarias lie outside the orbit of Mars, whose aphelion distance is 1.67 AU. Hungaria asteroids have nearly circular (low-eccentricity) orbits but large orbital inclinations to Earth's orbit and the general plane of the solar system. Four known asteroid groups fall beyond the main belt but within or near the orbit of Jupiter, with mean distances from the Sun between about 3.28 and 5.3 AU. Collectively called outer-belt asteroids, they have orbital periods that range from more than one-half that of Jupiter to approximately Jupiter's period. Three of the outer-belt groups, the Cybeles, the Hildas, and Thule, are named after the lowest-numbered asteroid in each group. Members of the fourth group are called Trojan asteroids (see below). As of 2009, about 930 Cybeles, 1,270 Hildas, 1 Thule, and 2,962 Trojans were known. In 1772 the French mathematician and astronomer Joseph-Louis Lagrange predicted the existence and location of two groups of small bodies located near a pair of gravitationally stable points along Jupiter's orbit. These are positions (now called Lagrangian points and designated L4 and L5) where a small body can be held, by gravitational forces, at one vertex of an equilateral triangle whose other vertices are occupied by the massive bodies of Jupiter and the Sun. These positions, which lead and trail Jupiter by 60° in the plane of its orbit, are two of the five theoretical Lagrangian points in the solution to the circular, restricted three-body problem of celestial mechanics. The other three stable points are located along a line passing through the Sun and Jupiter. The presence of other planets, however—principally Saturn—perturbs the Sun-Jupiter-Trojan asteroid system enough to destabilize these points, and no asteroids have been found near them. In fact, because of this destabilization, most of Jupiter's Trojan asteroids move in orbits inclined as much as 40° from Jupiter's orbit and displaced as much as 70° from the leading and trailing positions of the true Lagrangian points. In 1906 the first of the predicted objects, (588) Achilles, was discovered near the Lagrangian point preceding Jupiter in its orbit. Within a year two more were found: (617) Patroclus, located near the trailing Lagrangian point, and (624) Hektor, near the leading Lagrangian point. It was later decided to continue naming such asteroids after participants in the Trojan War as recounted in Homer's epic work the Iliad and, furthermore, to name those near the leading point after Greek warriors and those near the trailing point after Trojan warriors. With the exception of the two "misplaced" names already bestowed (Hektor, the lone Trojan in the Greek camp, and Patroclus, the lone Greek in the Trojan camp), this tradition has been maintained. Of the 2,962 of Jupiter's Trojan asteroids discovered, 56 percent are located near the leading Lagrangian point and the remainder near the trailing one. Astronomers estimate that 1,800-2,800 of the total existing population of Jupiter's Trojans have diameters greater than 15 km (9 miles). Since the discovery of Jupiter's orbital companions, the term Trojan has been applied to any small object occupying the equilateral Lagrangian points of other pairs of relatively massive bodies. Astronomers have searched for Trojan objects of Earth, Mars, Saturn, and Neptune, as well as of the Earth-Moon system. It was long considered doubtful whether truly stable orbits could exist near these Lagrangian points because of gravitational perturbations by the major planets. However, in 1990 an asteroid later named (5261) Eureka was discovered librating (oscillating) about the trailing Lagrangian point of Mars, and since then two others have been found; one additional potential Martian Trojan awaits confirmation of its orbit. Six Trojans of Neptune, all associated with the leading Lagrangian point, were discovered beginning in 2001. Although Trojans of Saturn have yet to be found, objects librating about Lagrangian points of the systems formed by Saturn and its moon Tethys and Saturn and its moon Dione are known. What is asteroid in geography?